Berkeley Investments will be presenting a proposed addition of two new office floors atop the Stillings Street garage, also known as 22 Boston Wharf Rd. The site is located within the Fort Point Landmark District. The project will also include the addition of windows on the northern wall of the existing building abutting the Q Park and the introduction of street level retail on Boston Wharf Road. According to June 11, 2015 Boston Business Journal website, Berkeley Investments is selling a majority of their Fort Point portfolio, which includes 343 Congress St., 12 Farnsworth St., 381 Congress St., and the Farnsworth Street and Stillings Street parking garages. 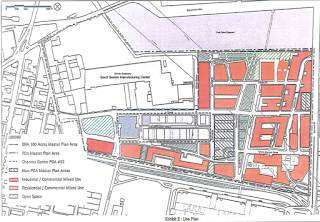 The article also states that Berkeley formally submitted plans to the Boston Redevelopment Authority today to add 50,000 square feet of office space atop its Stillings Street parking garage at 22 Boston Wharf Road. Please save the date: Tuesday, June 30th for the FPNA Neighborhood Meeting featuring Christopher Cook, City Of Boston Commissioner of Parks & Recreation and Josh Kraft, CEO of the Boys & Girls Clubs of Boston and President of the New England Patriots Charitable Foundation. The meeting will take place at 315 on A's Sky Lounge at 6pm.